One Vanderbilt (also One Vanderbilt Place) is a skyscraper under construction at the corner of 42nd Street and Vanderbilt Avenue in midtown Manhattan, New York City. Proposed by New York City Mayor Bill de Blasio and developer SL Green Realty as part of a planned Midtown East rezoning, the tower will stand next to Grand Central Terminal. Ongoing construction of One Vanderbilt on March 23, 2019. A groundbreaking ceremony for One Vanderbilt was held in October 2016. When completed in 2020, the 67-floor, 1,600,000-square-foot (150,000 m2) skyscraper's roof will be 1,301 feet (397 m) high and its spire will be 1,401 feet (427 m), making it the city's fourth-tallest building after the completion of Central Park Tower and 111 West 57th Street. In the early 2000s, amid a building trend that saw Manhattan office space increase from 2000 to 2016, SL Green Realty began looking at sites for a new office tower in Midtown. The company began buying buildings on the block bounded by Vanderbilt Avenue, 42nd Street, Madison Avenue, and 43rd Street, part of the Terminal City area. Meanwhile, the administration of Mayor Michael Bloomberg sought to redevelop the 73 blocks adjacent to Grand Central Terminal, and rezoned them in September 2013. Bloomberg's plans for an entire district of new high-rises were rejected in November 2013 because residents, preservationists, and local politicians complained about the prospective influx of office workers to the area, but the One Vanderbilt project moved ahead. Under plans released in May 2014, the skyscraper was to be 65 stories high, and the proposal came with transit improvements to Grand Central as well as a new 14,000-square-foot (1,300 m2) pedestrian area on Vanderbilt Avenue between 42nd and 43rd Streets. The development received approval from the New York City Landmarks Preservation Commission in July 2014 and unanimous approval from the New York City Council in May 2015. A projected completion date of 2020 was revealed in December 2014. When plans for One Vanderbilt were publicly announced, Andrew Penson — the founder of Midtown TDR Ventures, which owned the land under Grand Central Terminal — threatened to sue for $1 billion over a dispute concerning air rights. In its September 2014 proposal to the city, SL Green proposed to pay $400 per square foot for the air rights, then build a 1,500-foot (460 m), 67-story building, twice as big as the zoning rules permitted. Penson proposed a deal under which SL Green would pay $400 million for 1.3 million square feet of air rights and spend another $210 million to build transportation improvements for the subway and commuter rail stations below. The developer rejected the offer, calling it a "publicity stunt" because it valued the air rights at $600 per square foot, nearly 10 times the $61 per square foot ($660/m2) Penson paid for it when he bought the station in 2006. In February 2015, Vanderbilt Avenue, between 42nd and 47th Streets, was rezoned under the Vanderbilt Corridor Rezoning Text Amendment, which allows redevelopment on the corridor. Penson subsequently sued the city and SL Green for $1.1 billion. That lawsuit was settled in August 2016, when Midtown TDR Ventures agreed to drop the suit in exchange for an undisclosed sum. In 2015, demolition at the site of One Vanderbilt began, starting the construction process of the skyscraper. The buildings that were demolished were built around the same time as Grand Central, albeit unremarkable-looking and unimportant to the station's function. The 18-story Vanderbilt Avenue Building, a Warren and Wetmore-designed structure at 51 East 42nd Street, opened as a six-story office complex in 1902 and expanded in the 1920s. It had a two-story Modell's store that sold sport-related items. The Carrère and Hastings-designed Liggett Building, at Madison and 42nd, opened in 1922. One block north, the Prudence Bond & Mortgage Building at Madison and 43rd, where Governor Al Smith once had gubernatorial campaign headquarters, dates to 1923. Two small structures along 43rd Street respectively housed "an Irish pub and a T.G.I. Friday's." During demolition of one of the buildings, a chandelier and a banister fell on four construction workers who were taking down the chandelier, injuring them. The project received a $1.5 billion construction loan in September 2016 from Wells Fargo, The Bank of New York Mellon, JPMorgan Chase, Toronto–Dominion Bank, Bank of China andLandesbank Baden-Württemberg. The official groundbreaking occurred on October 18, 2016, in an event attended by Mayor Bill de Blasio as well as several SL Green executives. In January 2017, South Korea's National Pension Service and development firm Hines Interests Limited Partnership paid a combined $525 million for a 27.6% and 1.4% stake in the development, respectively. Foundation laying started in February 2017. The foundation was completed later that year, with the full building expected to be open in 2020. The construction of One Vanderbilt's steel structure reached above ground level in October 2017. One Vanderbilt's construction proceeded faster than originally scheduled, and by February 2018, the tower had been completed to the ninth floor. By June of the same year, the tower had reached the sixteenth floor. Facade installation began in August 2018, at which point the structure had passed the 30th floor, or more than half its eventual height. By November, the structure had reached the 56th floor, high enough to provide views above neighboring buildings. The same month SL Green refinanced the construction loan, increasing the size by $250 million to $1.75 billion and reducing the interest rate. The building will take up the block bounded by Madison Avenue, Vanderbilt Avenue, and 42nd and 43rd Streets. Air rights from 110 East 42nd Street, the former Bowery Savings Bank building, were obtained in order to allow for the proposed height. One Vanderbilt is being designed by Kohn Pedersen Fox. The 57-floor, 1,600,000-square-foot (150,000 m2) skyscraper's roof will be 1,301 feet (397 m) high and its spire will be 1,401 feet (427 m), making it the city's fourth-tallest building, after One World Trade Center, 111 West 57th Street, and the Central Park Tower – and making it taller than the nearby Chrysler Building. Upon completion, it will be among the world's 30 tallest skyscrapers. TD Bank was signed as the anchor tenant for the building, operating within a ground-floor space of 200,000 square feet (19,000 m2). The total cost of the building is anticipated to exceed $3 billion. The top 58 floors will be designated as 1,700,000 square feet (160,000 m2) of "Class A" office space. There will be fewer stories in One Vanderbilt than in other skyscrapers of similar height because each floor will have a ceiling that is 14.6 to 20 feet (4.5 to 6.1 m) high. There is also to be a 30,000-square-foot (2,800 m2) "world-class dining" area for tenants. One Vanderbilt would contain a rooftop observation deck that would be among the city's highest; it was expected to cost approximately $35 million to $39 million. One Vanderbilt's facade and design is intended to integrate with Grand Central, across the street. It is set 10 feet (3.0 m) back from the street to allow better views of Grand Central, and the open spaces in One Vanderbilt will span up to 105 feet (32 m) high. The base would include a 4,500 square feet (420 m2) lobby. Its glass facade was described as having terra-cotta in the design, which "would counter the existing office buildings on Madison Avenue and make a connection—a 'selective recall'—to Grand Central." On the bottom few floors, the top section of the facade slopes upward, while the bottom section slopes downward, creating a "diagonal wedge" so that the lobby area on Vanderbilt Avenue (facing Grand Central) would have a ceiling sloping from 50 to 110 feet (15 to 34 m) from west to east. Rendering of the tower's roof. The building is advocated for by the Landmarks Preservation Commission due to its proposed environmentally friendly, Leadership in Energy and Environmental Design-conforming model. New York Magazine described One Vanderbilt as a rare "civic-minded Goliath," in that while other skyscrapers are usually built in a design that maximizes profit, One Vanderbilt's base is designed for easier pedestrian and transit access in the nearby area. The new building also coincides with the MTA's East Side Access project, which is constructing a new Long Island Rail Road station under Grand Central. One Vanderbilt's construction also includes improvements that would provide extra capacity for over 65,000 passengers going into the New York City Subway at Grand Central–42nd Street. The improvements include an underground connection between Grand Central Terminal and One Vanderbilt; new mezzanines and exits for the subway station, including an entrance directly to the 42nd Street Shuttle platforms; three new stairways to each of the Lexington Avenue Line platforms (along the 4, ​5, ​6, and <6> trains); reconfiguration of columns supporting the nearby Grand Hyatt New York hotel; and a commuter waiting room in the building's lobby. This would directly result in additional capacity for the subway station, with 4,000 to 6,000 more subway passengers per hour being able to use the station. These improvements would cost over $200 million. Outside, Vanderbilt Avenue between 42nd and 43rd Streets would become pedestrian-only. The MTA mandated the station improvements in exchange for allowing the tower's construction. In 2015, SL Green gave $220 million toward the building's construction, of which two-thirds of the money would be used for station redesign, marking the largest private investment in the subway system to date. 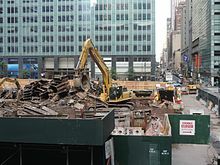 As part of the station construction, 40% of the basement of the Grand Hyatt New York would be destroyed in order to make room for the expansion of the subway mezzanine, as well as two new subway entrances in the One Vanderbilt building itself. ^ "One Vanderbilt". Skyscraper Page. Retrieved September 6, 2014. ^ a b c d e f Morris, Keiko (October 17, 2016). "Developer Sees Manhattan Office Tower as a New Landmark". Wall Street Journal. ISSN 0099-9660. Retrieved October 19, 2016. ^ a b c d e f Warerkar, Tanay (October 18, 2016). "One Vanderbilt reveals public plaza, huge transit hall in new renderings". Curbed NY. Retrieved October 19, 2016. ^ a b c d e f g h i j k l Chaban, Matt A. (October 16, 2016). "Future Neighbor Will Tower Over Grand Central, but Allow It to Shine". The New York Times. ISSN 0362-4331. Retrieved October 19, 2016. ^ "East Midtown Rezoning" (PDF). nyc.gov. New York City Department of City Planning. 2013. Retrieved October 19, 2016. ^ Bagli, Charles V. (November 12, 2013). "End of Proposal to Raise Skyline on the East Side". The New York Times. ISSN 0362-4331. Retrieved October 19, 2016. ^ a b c d e Bagli, Charles V. (May 29, 2014). "65-Story Tower Planned Near Grand Central Terminal". The New York Times. ISSN 0362-4331. Retrieved October 19, 2016. ^ a b c Salinger, Tobias (July 23, 2014). "One Vanderbilt Gets Advisory Nod from LPC". Commercial Observer. ^ Schlanger, Danielle (May 27, 2015). "1 Vanderbilt Gets the Go-Ahead from City Council". Commercial Observer. ^ a b Kusisto, Laura (September 12, 2014). "Residents Try to Get Details on New Midtown East Plan". WSJ. Retrieved September 13, 2014. ^ a b c "KPF Pen New York Supertall". Skyscraper News. December 7, 2014. Retrieved December 8, 2014. ^ Salinger, Tobias (July 16, 2014). "Grand Central Landlord Threatens Lawsuit Over One Vanderbilt - Commercial Observer". Commercial Observer. Retrieved September 13, 2014. ^ Bagli, Charles V. (September 23, 2014). "Owner of Grand Central Vies With Developer Over Skyscraper on an Adjacent Block". The New York Times. Retrieved October 12, 2014. ^ "Grand Central owner offers SL Green $400M for One Vanderbilt". The Real Deal. September 24, 2014. Retrieved October 12, 2014. ^ a b Bagli, Charles V. (September 23, 2014). "Owner of Grand Central Vies With Developer Over Skyscraper on an Adjacent Block". The New York Times. ISSN 0362-4331. Retrieved January 21, 2019. ^ "Vanderbilt rezoning the start of something big". Real Estate Weekly. March 11, 2015. Retrieved March 12, 2015. ^ "Grand Central owner suing city, SL Green for $1.1B". The Real Deal New York. September 29, 2015. Retrieved January 21, 2019. ^ Plitt, Amy (August 10, 2016). "One Vanderbilt lawsuit settled, paving way forward for Midtown supertall". Curbed NY. Retrieved October 20, 2016. ^ Bagli, Charles V. (August 10, 2016). "Owners of Grand Central Drop Lawsuit, Clearing Way for a 1,401-Foot-Tall Skyscraper". The New York Times. ISSN 0362-4331. Retrieved January 21, 2019. ^ Cuozzo, Steve (March 15, 2016). "One Vanderbilt mega-office tower picking up steam". New York Post. Retrieved October 19, 2016. ^ YIMBY, New York (June 17, 2014). "New Details Released for One Vanderbilt". New York YIMBY. Retrieved August 24, 2014. ^ Kusisto, Laura; Shallwani, Pervaiz (April 7, 2015). "Four Workers Hurt in Collapse At Midtown Manhattan Demolition Site". Wall Street Journal. Retrieved December 1, 2018. ^ "Four construction workers injured at One Vanderbilt site". The Real Deal. April 7, 2015. Retrieved December 1, 2018. ^ Balbi, Danielle (September 28, 2016). "SL Green Closes on $1.5B Construction Loan for One Vanderbilt". Commercial Observer. ^ Hurowitz, Noah. "One Vanderbilt Construction Underway After Official Groundbreaking". DNAinfo New York. Archived from the original on October 20, 2016. Retrieved October 19, 2016. ^ Cullen, Terence (January 26, 2017). "SL Green Forms One Vanderbilt JV with Korean Pension Fund, Hines". ^ Davis, Andrew (February 9, 2017). "4,000 cubic yards of concrete go into One Vanderbilt foundation". Archpaper.com. Retrieved December 4, 2018. ^ Warerkar, Tanay (October 4, 2017). "One Vanderbilt's steel superstructure finally rises above ground". Curbed NY. Retrieved December 4, 2018. ^ Walker, Ameena (February 28, 2018). "One Vanderbilt construction is already ahead of schedule". Curbed NY. Retrieved December 4, 2018. ^ Plitt, Amy (June 6, 2018). "Aerial photos show off One Vanderbilt's swift rise in Midtown". Curbed NY. Retrieved December 4, 2018. ^ Young, Michael (August 14, 2018). "One Vanderbilt's Terracotta Facade Installation Begins as Superstructure Passes Halfway Point in Midtown Manhattan". New York YIMBY. Retrieved December 4, 2018. ^ Plitt, Amy (November 2, 2018). "See the views from Midtown's soon-to-be supertall One Vanderbilt". Curbed NY. Retrieved December 4, 2018. ^ "Form 8-K". SL Green. January 23, 2019. ^ Cuozzo, Steve (June 2, 2014). "1 Vanderbilt: High on Grand Central - New York Post". New York Post. Retrieved September 13, 2014. ^ "New Details Released for One Vanderbilt -- New York YIMBY". Retrieved September 13, 2014. ^ a b "Midtown Giant One Vanderbilt (Mostly) Wows at Landmarks - Megatower Watch - Curbed NY". Curbed NY. Retrieved September 13, 2014. ^ a b c Dailey, Jessica (May 27, 2015). "City Council Green Lights 1,500-Foot One Vanderbilt". Curbed. Retrieved August 5, 2015. ^ "One Vanderbilt to 1 WTC: My view's $5 nicer than yours". The Real Deal New York. June 5, 2018. Retrieved December 4, 2018. ^ Davidson, Justin (October 18, 2016). "Is One Vanderbilt the 1,400-Foot-Tall Building We Need?". Daily Intelligencer. New York Magazine. Retrieved October 19, 2016. ^ Cuozzo, Steve (September 8, 2014). "A sneak peek at One Vanderbilt's Grand Central plan". New York Post. Retrieved September 13, 2014. ^ Kabak, Benjamin (September 9, 2014). "A glimpse at the $200M transit plans for One Vanderbilt :: Second Ave. Sagas". Second Ave. Sagas. Retrieved September 13, 2014. ^ a b c d Hawkins, Andrew J. (September 8, 2014). "$210M upgrade for Grand Central's subway unveiled". Crain's New York Business. Retrieved August 1, 2017. ^ Budin, Jeremiah (September 8, 2014). "One Vanderbilt Comes with $200M of Subway Improvements". Curbed NY. Retrieved September 13, 2014. ^ a b c Cuozzo, Steve (December 3, 2018). "Four new leases planned for superstructure One Vanderbilt". New York Post. Retrieved December 15, 2018. ^ Morris, Keiko (April 17, 2017). "One Vanderbilt Taps Daniel Boulud to Create a Restaurant and Cafe". Wall Street Journal. Retrieved December 4, 2018. ^ "SL Green Signs TD Securities to 171,000 Square Feet at One Vanderbilt Avenue and 125 Park Avenue". MarketWatch. December 3, 2018. Retrieved December 4, 2018. ^ "TD Bank's investment-banking arm takes 120K sf at One Vanderbilt". The Real Deal New York. December 3, 2018. Retrieved December 4, 2018. ^ Rizzi, Nicholas; Schram, Lauren Elkies; sturdivant-Sani, Christina (September 27, 2017). "German Bank Becomes One Vanderbilt's Second Office Tenant". Commercial Observer. Retrieved December 4, 2018. ^ Cuozzo, Steve (July 31, 2018). "Carlyle Group signs on for three floors at One Vanderbilt". New York Post. Retrieved September 11, 2018. ^ La Guerre, Liam (April 25, 2018). "Law Firm McDermott Will & Emery Taking 106K SF at One Vanderbilt". Commercial Observer. Retrieved December 4, 2018. ^ Rizzi, Nicholas; Schram, Lauren Elkies; sturdivant-Sani, Christina (January 26, 2018). "Greenberg Traurig Taking Four Floors at SL Green's One Vanderbilt". Commercial Observer. Retrieved December 4, 2018. Wikimedia Commons has media related to One Vanderbilt.